To report an issue with a War Memorial please click on the button below to skip to our online contact form. 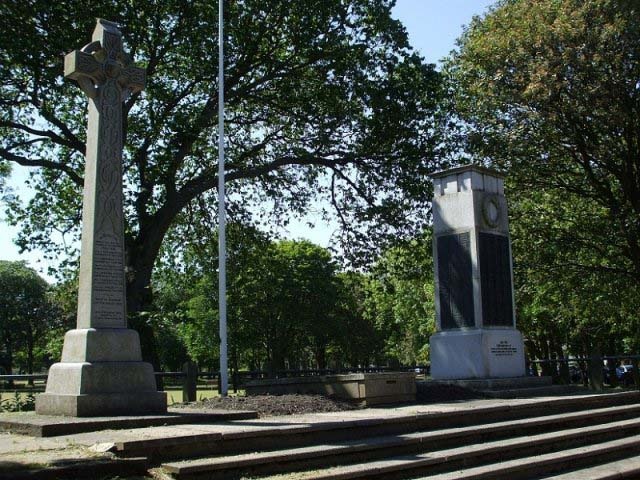 In June 2018 work commenced on the restoration and refurbishment of the memorials at Ridley Park, Newsham and Cowpen to be completed in time for remembrance services and the Centenary of the First World War. This followed a lengthy process of surveys, planning applications and a tender process to appoint a specialist contractor to carry out the work. Art of Stone, a Blyth company, were awarded the contract to carry out the restoration to all of the memorials. They sub-contracted Kevin Tilmouth Commercial Limited who carried out the underpinning of the memorials in Ridley Park and all of the paving and landscape work involved in the refurbishment. New columns were made for the memorial at Newsham to replace those that were damaged and the name panels were restored and the memorial cleaned. The Cowpen memorial was cleaned and restored and the lettering on the plaques repainted. The most significant part of the restoration on this memorial was the replacement of the soldier which was beyond repair. Substantial donations were made by the Elswick (Blyth) All Arms Association and the Freemasons of Northumberland towards the cost of the new soldier statue. 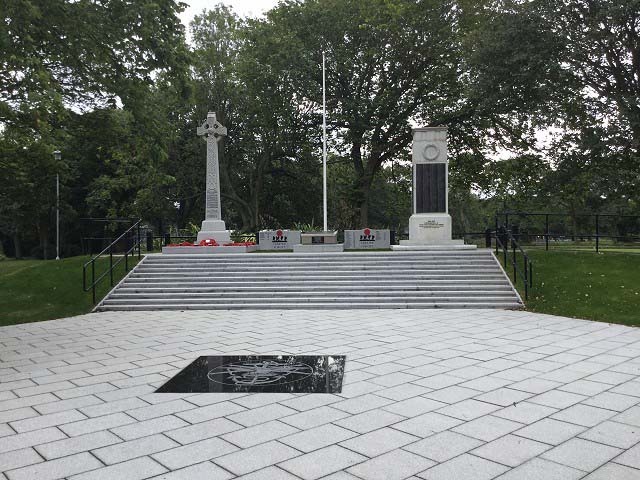 The Cenotaph in Ridley Park underwent the biggest transformation with a complete refurbishment. The Boer War Memorial was originally located at the junction of Bridge Street and Freehold Street. It was designed by Morrison and McLean of Gateshead and was unveiled on 22 July 1903 by Lord Ridley. The monument was moved to Ridley Park in 1950. The First World War Memorial for the town of Blyth, including New Delaval, Newsham, Bebside and Cowpen, was erected outside the Knight Memorial Hospital on Beaconsfield Street. It was unveiled on 17 November 1923 by the Duke of Northumberland and dedicated by Reverend A Tucson, Vicar of Blyth, in commemoration of 637 servicemen who died in the First World War. The memorial was moved to its location in Ridley Park in 1950. The World War Two Memorial was placed in Ridley Park in 1950. When work started on the refurbishment programme it was discovered that there were no foundations and this had been the reason for the subsidence that was in the initial survey report. The World War II memorial was dismantled and the subsidence issues were resolved. All the memorials were cleaned and the names re-painted. New memorials were created to incorporate the names of those not on the original memorials and also to commemorate those who have died in conflicts post 1945. The parade area was paved and the steps re-laid in granite. An accessible path was added from the parade area to the top of the Cenotaph to allow those with restricted mobility to access the memorials to lay wreaths. A dropped kerb to the path was created to aid access and six dome bollards installed at the entrance to the parade area to limit vehicular access. Handrails were installed at either side of the steps, at the side of the accessible path and behind the memorials. This work was carried out by D & M Fencing who also supplied the steel troughs that have been placed beside the memorials to hold crosses. The final flourish to the parade area was the installation an engraved, polished plaque depicting the emblem of the All Arms Association. * Please note - to ensure that this form is submitted by a human, you will need to copy the text to the right of the CAPTCHA field in to the form so that it can be processed. We use this method to identify spam. Your privacy is important to us. All information submitted will be used solely for the purposes of the subject matter you are reporting. To view our General Public Privacy and Data Protection policies, please Click Here.